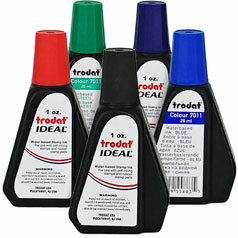 Replacement water-based ink for Trodat self-inking stamps. Available in black, blue, red, green or violet. Rated 5 out of 5 by Buddy66 from Great asset Replenished much used self inking stamp and restored imprint to original quality. Rated 5 out of 5 by Minuteman1969 from Great ink! I bought two bottles and though I've only had need to use it once so far, I am very happy with the quality and quantity of the ink. Rated 5 out of 5 by Jane at Pacer from Great Stamps! The stamps I have ordered were exactly what I needed. The turn around time was great. Will order again. Rated 4 out of 5 by Election from Good Coloring Easy to use. The shade of purple was fine.I was hoping this would be a little more on the purple side. Rated 2 out of 5 by Eddie from Ink is fine but something is wrong with the bottle The ink seems to be fine however, there seems to be an issue with the ink bottle. It breaks at the neck simply by screwing the cap on. It would be great if the bottle was thicker or better constructed. Trodat Replacement Ink Vial (1 oz) is rated 4.3 out of 5 by 7.